Our firm, established especially to work in iron & steel sector, proved itself as one of the leading firm of this sector with the works realized in domestic region and foreign countries since 1990. By following the developments in the world, we continue to realize the undertaken projects with the purpose of enhancing the quality and performance to the highest level. Our main target is the product quality and improvement of the quality in all stages of the work; project designing, basic and detail engineering, manufacturing, erection and commissioning. Our business principle is to show maximum effort to meet all the expectations of our customer with our team following all the developments on the related sectors and continuously improving themselves. The VEMZ Rolling Mill in Ivanovo Russia, which is the first part of the VEMZ Project, has been successfully commissioned and put in production. 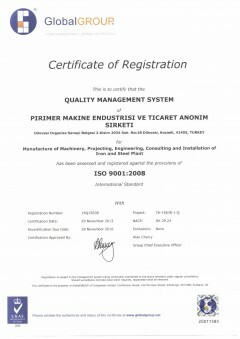 ISO 9001:2008 quality certificate is issued for Pirimer Makine Endüstrisi on 29.11.2013. PİRİMER MAKİNA ENDÜSTRİSİ VE TİC. A.Ş. PİRİMER DIŞ TİCARET VE METAL SANAYİ A.Ş.